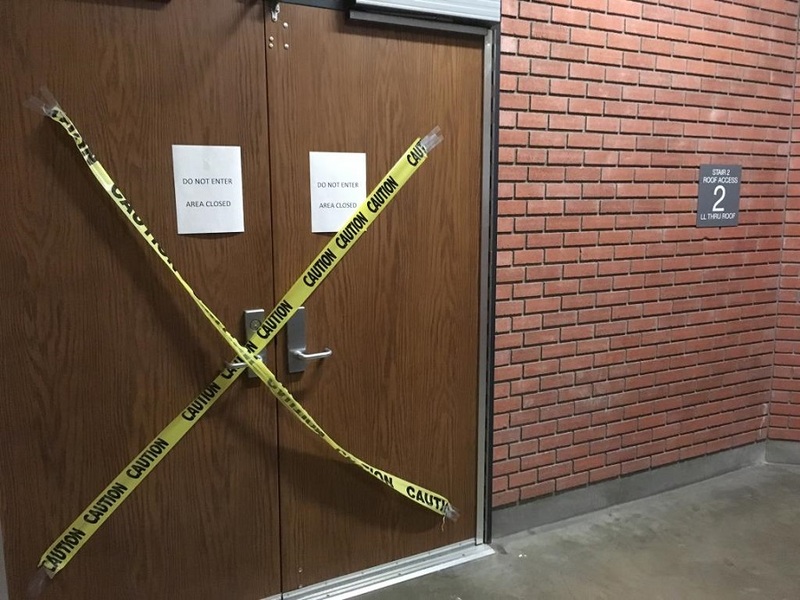 The bookstacks and main study areas of the second floor in the CSULB University Library have been closed since early October following the discovery of mold. Photo by Jeanette Martinez. A Cal State Long Beach library floor that contain hundreds of thousands of books and provides study areas for students is expected to open this week after being closed off for two months following the discovery of mold. The mold was discovered by library personnel on October 6. Named aspergillus, it is a common, innocuous form of household mold that, unless you have a previous respiratory condition, doesn’t pose a hazard, according to Tony Malagrino, director of facilities management. “It looks like [light green] peach fuzz on the spine of the books,” he said. Malagrino estimated that just over 100 copies out of about 200,000 in the stacks area of the second floor were affected and that it will depend on the head librarian to see if they can be individually cleaned and saved. The stacks include books on a variety of subjects, everything from history to philosophy, he added. Two dozen or so rare materials in the library’s Special Collection on the third floor that remains open were also found to have mold, Malagrino said, and they will be preserved and cleaned by a professional company. These materials include “unusual and valuable collections of rare and fragile books, original art prints and photographs, and historical papers,” according to the university website. The library’s second-floor book stacks and main study area are expected to open by midweek, according to Malagrino. “We wanted to get the students access to the second floor so they can prepare and study for their exams and have the full use of the library and then we’re going to probably split the Special Collections between our people who are good at cleaning and the people who need to take really good care of rare books that have mold,” Malagrino said. Malagrino believes the mold may have formed over the summer when facilities personnel had to fix a pipe due to an interruption in hot water. While they repaired the issue during those few days the floors did not have good humidity control. When the mold was discovered the university called on Titan Environmental—the same company that recently tested drinking fountains on campus following the discovery of lead—to conduct testing of the library’s mold as well as the air quality. A few days later, Titan Environmental not only found mold in the stacks area and in Special Collections, but they also found a different kind of mold in a mechanical space in the basement, Malagrino said. The cause for that mold is speculated to be the result of maintenance crews water pressuring the sidewalks outside the library or due to rainfall that contributed to water penetrating the basement. While a separate water proofing contractor is working on fixing the issue in the basement, the university has decided to fix the mold issue on the second and third floors in-house to save on costs that would be incurred if they went with an outside company. Malagrino said facilities personnel have been trained and certified by Titan to conduct the cleaning.